The Chief Instructor of Two Rivers Aikikai is Spiros Koyanis, 6th dan Shidoin, who trained under the late Mitsunari Kanai, 8th dan Shihan from 1983 until Kanai Sensei's passing in March, 2004. Senior instructor Lynn Marshall, 5th dan, Shidoin also trained extensively under the late Mitsunari Kanai, Shihan. Thus the dojo's Aikido style is primarily influenced by Kanai Sensei's teaching of Aikido and his theory of the unified body. Our style pays close attention to "ma-ai" both before and after an Aikido technique allowing for the effectiveness of non-violence as self defense. In Iaido, our instructors teach Muso Shinden Ryu style under the guidance of Claude Berthiaume Sensei. Our dojo is a member of Kiyoikaze Iaido Federation whose purpose is to develop and guide the instruction of Iaido as established by Mitsunari Kanai Sensei and carried on by Technical Director, Claude Berthiaume Shihan. More information on our Iaido program is available on our About Iaido page. Two Rivers Aikikai is a non profit organization affiliated with the Aikido World Headquarters at Aikikai Hombu Dojo in Japan through the United States Aikido Federation. Two Rivers Aikikai is also a member dojo of Kiyoikaze Iaido Federation. The dojo was founded as a non profit organization in 1991 by Edmund Di Marco Sensei 6th Dan and Ken Brown Sensei 3rd Dan. 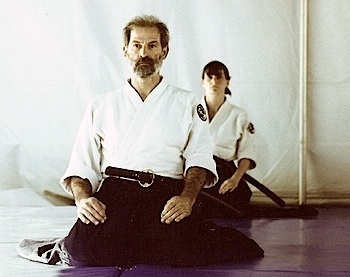 Spiros Koyanis Sensei, 6th dan in Aikido and 4th dan in Iaido, has been Chief Instructor at the dojo since June 2001. We take pride in our mural painted by Portland Artist Christa Grimm. 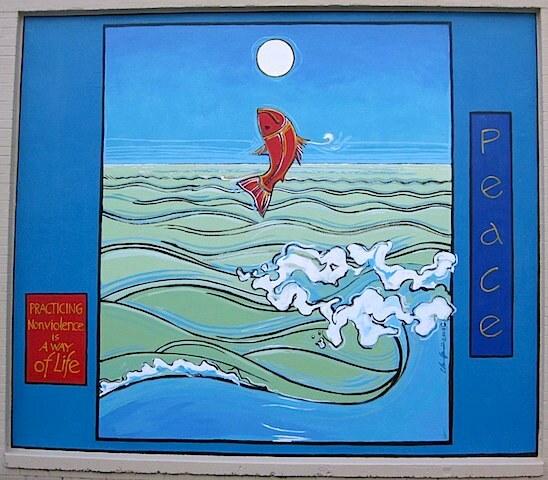 Two Rivers Aikikai chose Christa to paint the new mural called Rising Up after a considerable search for an artist who could create a mural which embodied our goals of practicing non-violence in body, mind and spirit. The mural represents perseverance and connection to meet life's challenges with the support of our environment and community. The mural's imagery of a migrating salmon, water currents, and cyclical forces resonates with the notions of blending, pliancy, giving and receiving, all of which are qualities practiced at Two Rivers Aikikai. Portland artist Christa Grimm creates murals, paintings and large scale site-specific commissions for both public and private clients. Alive with color, movement and strong, confident brush strokes her images celebrate natural beauty and human vitality. Our Chief Instructor is Spiros Koyanis Sensei, 6th Dan, Shidoin in Aikido and 4th Dan in Iaido. He is a direct student of the late Mitsunari Kanai Shihan and practiced under Kanai Sensei's guidance for twenty one years. Koyanis Sensei began his training at New England Aikikai in 1983 and has been teaching Aikido to adults and children since 1989. In 2001, he became Chief Instructor of Two Rivers Aikikai. 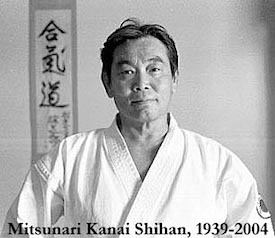 He is a firm believer in the effectiveness of non violence and as such honors the memory of Kanai Sensei in his instruction by paying close attention to Kanai Sensei's dynamic theories of the unified body and the interaction between uke and nage based on budo. Koyanis Sensei believes that Aikido is a fluid martial art that continues to grow and change based on modifications by leading practitioners. He trains several times a year at USAF seminars under the direction of Yoshimitsu Yamada Sensei and the members of the USAF Technical Committee. Koyanis Sensei teaches classes in Aikido and Iaido. His Aikido classes often include practice with bokken, jo and tanto (wooden weapons) because the precision required with weapons complements and enhances our style of Aikido. Lynn Marshall, 5th Dan, Shidoin is also a direct student of Mitsunari Kanai Shihan. Lynn Sensei practiced karate for a year before starting Aikido at New England Aikikai in 1985. Lynn Sensei's extension and precision demonstrate that one does not have to be big to be effective. Her ability to break down a technique and focus on details gives students a lot to think about and work with in the beginner and basics program at Two Rivers. Lynn Sensei has been practicing at Two Rivers Aikikai since July 1998. 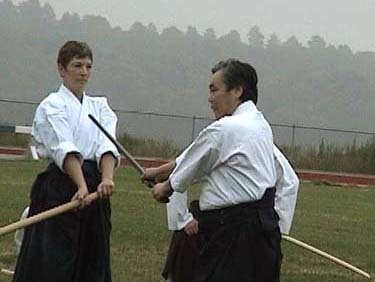 She teaches a wide variety of techniques and often includes bokken suburi and jo kata in her classes. With a strong emphasis on fundamental foundation of techniques, Lynn demonstrates advanced techniques with clarity and precision for students in mixed level classes. She is a reliable reference for students preparoing for kyu and dan tests. In addition to Aikido, Lynn practices yoga and brings a wealth of knowledge to our students about proper stretching to gain flexibility and strength and to prevent injury. Lynn continues to hone her Aikido techniqe at USAF seminars throughout the year. Assistant Aikido instructors are ranked Nidan or above. 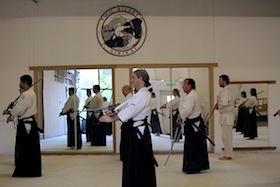 Assistant Iaido instructors are ranked Sandan or above. Two Rivers Aikikai occupies a former futon factory on Southeast Belmont Street. It took several months of hard work to clean and renovate the space. 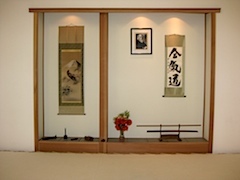 Our Tokonoma and 1500 square foot mat were built by our students. Part of our training includes sweeping the mat after class and keeping the dojo clean and neat. We have separate dressing rooms with showers for men and women and an accessible restroom with a shower. Two Rivers Aikikai supports each person's right to choose which changing room they use. and sexual orientation to all the rights, privileges, programs and activities that are available to all members.